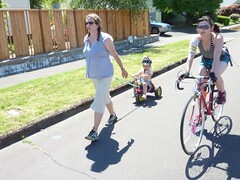 Could Sunday Parkways be Everyday? That's the question I asked myself as I watched thousands of people on bikes and foot stream by for the Southeast Sunday Parkways event yesterday - could this happen everyday? But I'm not talking about designating certain routes for non-motorized transportation. Rather, I'm talking about sharing the streets with thousands of people walking and biking for their everyday transportation needs. take place on Bicycle Boulevard routes? The truth is I believe Sunday Parkways could be everyday (and yes, I know I've drunk the kool aid). Think about some of our bike lanes right now: N Williams Ave sees 6,000 bike a day! That's approximately one quarter of all the people that come out to a Sunday Parkways event! Now imagine those 6,000 people on bikes and foot magically cut-and-pasted out of the 5-foot wide N Williams bike lane and onto a tree-lined street with few stop signs, slow auto traffic speeds, and roadside signs directing you to your destination. Heaven, right? Well yes, and Portland. The City's next big thing for bikes will be a network of Bike Boulevards (aka Neighborhood Greenways) that give priority to people walking and biking, while making the street safer for people using it - whether they are in a car or a bike or for residents living beside it. 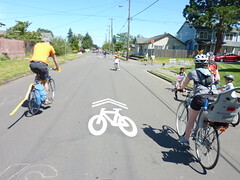 All of our Sunday Parkways routes highlight existing or future Bike Boulevards. Yesterday in Southeast, cyclists and pedestrians traveled along the SE Salmon/Taylor, Ankeny, and 42nd Ave Bike Boulevards. While the route was closed to cars yesterday, most days you'll see a lot more bikes on those streets than cars. That's what I wanted to tell all those people streaming by yesterday: Sunday Parkways can be everyday - all that's missing is you. To see a map of all the City's Bike Boulevards and other bicycle lanes and paths, check out our neighborhood bike and walk maps (in Spanish now, too!). If you need help planning your bike route, order a free bike route plan on-line. My sister and I walked the whole Sunday Parkways route in SE Portland on Aug. 15 and I can definitely tell you that there were NOT thousands of walkers...very few actually that I saw. Far more bicyclists - I'd say about 97% were on bikes. It was difficult to share the road with them because there were so many, a little scary to cross the traffic at times when you wanted to see an event or visit a booth...I also walked the outer SE Sunday Parkways where there were fewer bicyclists. I like the idea of pedestrian-only areas where cars can't go, but I think there still needs to be a safe area for walkers when mixed in with bicyclists. Thanks for the comment, Erica. I'm going to forward to our Sunday Parkways team. I like the idea of more pedestrian focused areas will expand the events appeal.